Must be public radio…there are totebags! Come by the KVGD-LP studio to pick up your bumper sticker. Available for a $2 donation to Goldendale Community Radio. Now we have totebags, too, with our cool logo. They are so very pretty. 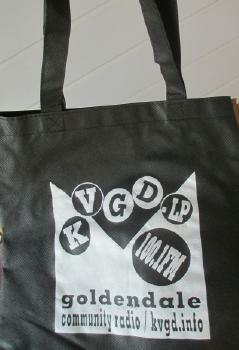 You can get a totebag for donation of $5 to Goldendale Community Radio. Heartfelt thanks to members and the public for your ongoing support!